Situated on the Arabian Peninsula, the Sultanate of Oman was the recent home for an ITTF/PTT Level One Coach Education Course and Training Camp; proceedings commenced on Sunday 6th November and concluded on Saturday 12th November. The expert on duty was Jordan’s Mohamed Atoum, who was making his third visit to the region to conduct such initiative organised under the auspices of the ITTF Development Programme. He visited in October 2012 and just under one year ago last December. Venue for the whole itinerary was the Sultan Qaboos Sport complex located in the capital city of Muscat; the premises proving ideal. Each day was organised in two sessions, the first in the morning from 9.00am to 12.00 noon, the second from 4.00pm to 7.00pm. Notably, five Stag table tennis tables were available; over 100 balls were provided in premises that afforded most pleasant surroundings for both theory and practical sessions. Throughout drinks were proved by the Oman Table Tennis Federation for the thirsty students. Furthermore, there was an added bonus; the centre provided accommodation for those who had travelled from beyond the boundaries of the port city. Overall, a total of 14 students attended the course, three being female; the aim of the Oman Table Tennis Federation being to invite active coaches in order that their skills could be developed to help beginners. Impressively, Asad Al Raiesi, a member of the Oman National Team attended, as did Adnan Fwakhergy who had travelled from Syria; he is coaching in the Ibri Club in Muscat. “We learned a lot of new skills, how to teach beginners and identify the talented players; we learned the right way to coach and how to teach players with a disability”, Adnan Fwakergey. 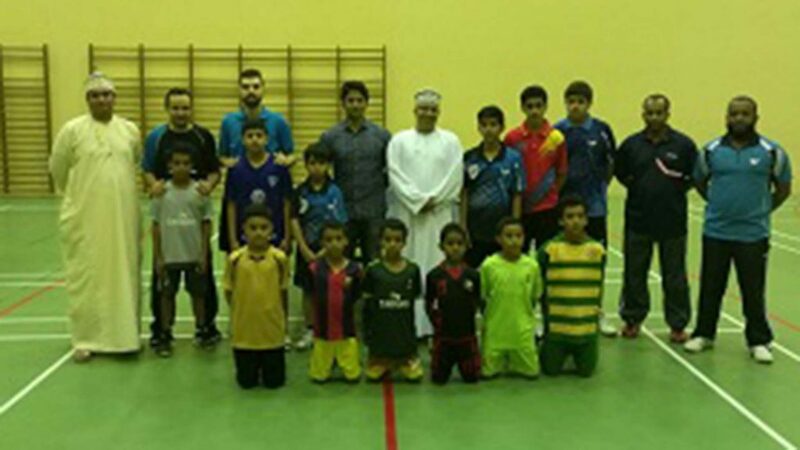 An enthusiastic group, all willing to learn, matters were opened by Rashid Al Mamari the Secretary-General of Oman Table Tennis Federation; he encouraged the course members to take full advantage of the opportunity presented. Also present was Mohammad Al Jassasi, the Chair of the Oman Table Tennis Federation’s Umpires and Coaches Committee; he advised his vision for the future, whilst expressing his delight at witnessing the high numbers present. In addition he thanked the Oman Table Tennis Federation and the International Table Tennis Federation for the opportunity that had been realised to stage the course. “First of all we enjoyed the course, time passed so quickly; were learned detailed information which I believe that can transfer the players to another level”, Asad Al Raiesi. Later at the Closing Ceremony Abduallah Bama Khalef, the Chair of the Oman Table Tennis Federation, echoed the words of Mohammad Al Jassasi in addition to congratulating the students. The five day course over, the concluding two days focused on a Training Camp for players under 15 years of age; the aim of the Oman Table Tennis Federation being to stage one such initiative each month. Throughout Mohamed Atoum focused on technical skills and physical preparation, a welcome visitor being Bhushan Thakur from the Stag Company who had played in Sweden for some five years. He spent time giving the benefit of his experience and advising the young players; also he attended the Closing Ceremony. A successful course and one which attracted media attention; Mohamed Atoum and Assad Al Raesi were guests at the Al Hadath programme broadcast live by the Oman Sport Television Channel. Undoubtedly a most worthwhile visit; an increase in knowledge and greater exposure, in more than one way, the course promoted table tennis in Oman.